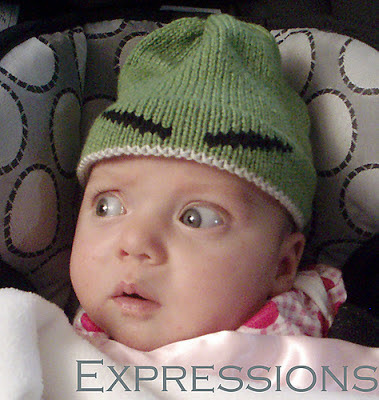 You all may remember this hilarious photo of my buddy Clara, wearing her very own Expression hat. The pattern has been tested and it's now available for pre-order. If you get it before December 3rd, you'll save $1.50 off the regular price! 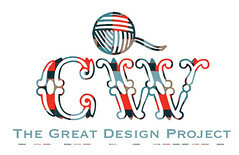 The sale ends when the pattern launches. These hats are so much fun, and I've had requests for several for Christmas. So far the most popular eyebrow chart (by a landslide) is the Angry eyebrow. I think all but one of my testers opted for that. One cutie got a set of Groucho Marx eyebrows, lol. You just gotta love a little kid in a hat with crazy-brows! Anyway, the pattern offers a large range of sizes, from newborn all the way up to adult large! The needles and yarn weights are all included, gauges for each size, and of course there are five different eyebrow charts to choose from. I'm personally looking forward to seeing the first uni-brow. Any takers? But I digress. The hats work up really fast and most knitters can finish one in a day or two. They make great last minute gifts, and they're a good way to use up yarn scraps or to play with fun colors you wouldn't usually work with. I used up the scraps of my Madeline Tosh Chunky in Gilded (a color I adore but I can't put right next to my skin, unless I want to look like I'm on my death bed), by striping it with cream and using red on the brim. That put the red and white closest to my face so I still look alive, but let me use my beloved color. 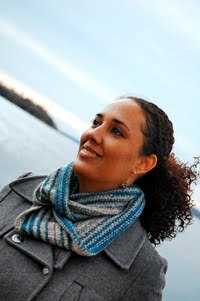 Also, the hem is great if you're knitting for children or someone with sensitive skin. You can use cotton, or a synthetic for the inside of the brim, and then switch to a warm animal fiber for the outside...best of both worlds! They're not itchy, and they can still be warm. It works for Alex (who has legitimate sensory issues and is very sensitive). So, go on over and join the dozen or so ladies who've already pre-ordered their copy :) They're fast. They're fun. There's a size for everyone (that rhymed!). 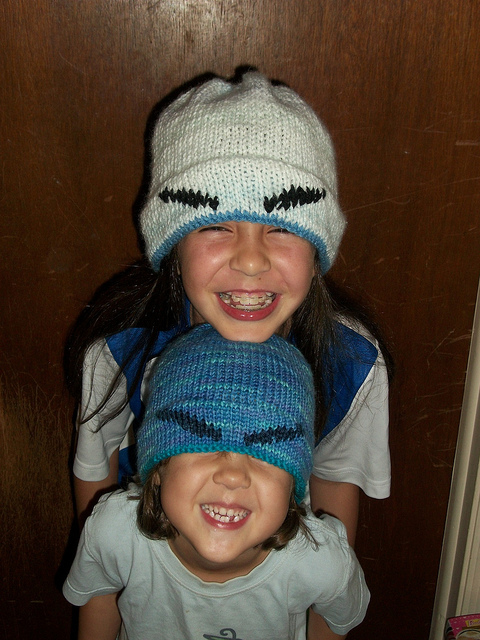 And if that's not enough to convince you...here's a photo of more kids in eyebrow hats, courtesy of one of my test knitters, Cathy, and a link to her blog post about the pattern. It's a good one!